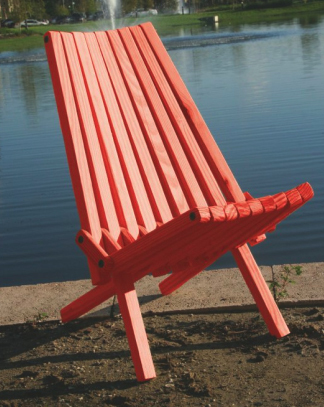 My friend Janet LeGrand of the wonderful shop, Paint Square, recently sent me an email with a link to this folding patio chair, named Chair x36. She thought it may make a good entry for Sweet Peach and I couldn't agree more. Patrick Cherix of Jacksonville, Florida, describes the chairs, conceptualized by designer, Ignacio Santos, as "online and accesible to everyone." Adding, "The idea is that beautiful products with great design, made with quality material can be accessible to everyone everywhere." These modern, American chairs begin at just $79. And these are Southern chairs, through and through. As Patrick explains, "We buy only premium Southern yellow pine from Alabama." They also source eco friendly wood from a lumber company certified by the government. Creation and assembly happens entirely in Jacksonville and they are proud to say that "All our chairs are totally handmade in the USA with American wood by American workers." Yellow pine is a beautiful wood to work with as you'll often find it was used as hardwood floors in older Southern homes. This wood is resistent to weather and truly has a gorgeous natural look. But the fun part is you can paint these any color you like to go with your decor. It's one of those outdoor or indoor chairs that has the style, cool and comfort to endure... Learn more about Chair x36 here.